Picking your own pumpkins for Halloween decorations and cooking is a fall tradition just about everywhere in the United States. Arizona is no different, and there are several places you can go to enjoy picking your pumpkins from a pumpkin patch, beginning at the end of September. These harvest festivals are located in the Phoenix area and are presented in alphabetical order, by the name of the farm or location. If you are willing to drive a couple of hours for a great family day trip, there are also harvest festivals within about a two-hour drive, give or take, depending on your starting point! Admission price includes a petting zoo, hay maze, panning for gold, western games, hayride to and from the pumpkin patch, train ride. Pony rides (extra charge). Pumpkin prices vary by size. Bring cash for vendors. Pumpkin Patch is stocked with fresh pumpkins daily, ranging from 1 ounce to 500 pounds at this family-owned farm. Did you grow a huge pumpkin? Register for the Pumpkin Weigh-Off for cash prizes. Admission includes an OZ pumpkin, decorating your pumpkin, the air bounce, a hayride, straw bounce, feeding the animals, and Alexander’s Adventure Maze. Bring a picnic lunch or buy snacks. Mother Nature’s Farm is a family owned and operated farm. 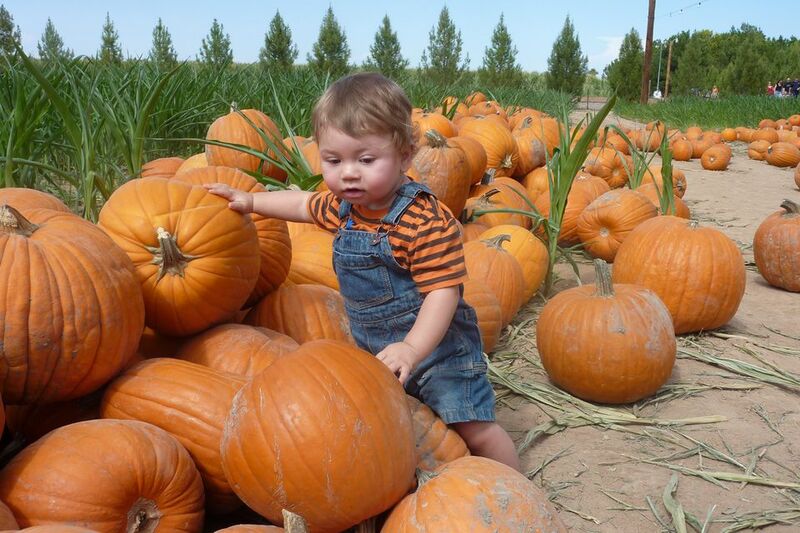 A fall festival in Buckeye, Arizona, complete with pumpkin patch and corn maze. Admission includes all activities on the farm (concessions and pumpkins sold separately), children in diapers are admitted free of charge. Activities typically include a pumpkin patch, corn maze, hay ride, farm obstacle course, sunflower field, tractor tire playground, jumping pillow, educational barn, farmer's market on Saturday and Sunday, mercantile, food trucks, seed bins. Rocker 7 Farm is a family owned and operated farm. At the Schnepf Farms Pumpkin & Chili Party, activities include hayrides, roller coaster, swinging ladybugs, honeybee adventure, flying farmers ride, carousel rides, jumping pillows, petting zoo, country road rally, rock climbing wall, miniature golf, bonfires, marshmallow roasting, four-acre corn maze, ten-acre celebrity corn maze, farmhouse museum, Hillbilly Bob’s Pig Races, BMX show, and Extreme Canine Dog Show. Fireworks show on Friday and Saturday nights. Train rides, pony rides, food, pumpkins, and some crafts have an extra fee. Schnepf Farms also is the place for the haunted attraction, The Outbreak. A 6-acre family corn maze (search for pieces of your map as you walk through), mini corn maze (perfect for little ones), petting zoo, train ride, jumping pillow, haunted corn maze, pedal carts. Extra charge for pumpkins and train rides. Check online for a discount coupon. Tolmachoff Farms also is the place for the haunted attraction, AZ Field of Screams, weekend nights. Usual activities include huge Corn Maze; Giant Jump Pad; Giant Tube Slide; Mini Hay Maze; Spider-Web Climb; Duck Races; Barrel Train Ride; Tractor Train Ride; Petting Zoo. Check online for details of special events like Pumpkin Paint and Take and Adopt a Pet Day.